Even if property agreements were nothing more than “divorce insurance,” they would still be worthwhile. After all, responsible people often obtain life insurance policies, especially after they start families, even if the likelihood of dying young is almost zero. But the fact is premarital agreements are much more and can actually strengthen a marriage. Money is one of the most commonly-cited causes of marital friction, and a premarital agreement removes such squabbles from the equation. Assume Husband has both title to some rather valuable unimproved land and a substantial amount of student debt, and Wife objects when Husband refuses to sell the land to payoff the loans and instead uses community funds. If the two had a premarital agreement, this issue could have been worked out in advance. Premarital agreements can cover other areas as well, such as succession and inheritance, to prevent misunderstandings and disagreements from mushrooming into expensive court battles. 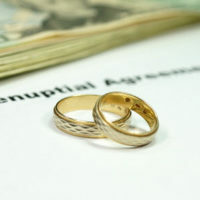 Property Division: In addition to dividing assets and debts between the spouses, premarital agreements can also classify these items as either marital or nonmarital property, thus avoiding time-consuming litigation during divorce. Spousal Support: As long as it is not blatantly one-sided, most courts uphold even tight caps on the amount and/or duration of payments, as there are often non-financial factors involved. Property Management: This feature is particularly useful if the couple has any income-producing property, because the buy or sell decision is made outside the stress of the moment. Premarital agreements cannot contain any provisions related to child support, child custody, or anything that is against public policy. Involuntary: Instead of mere pressure to sign, most Florida courts consider a number of factors when determining voluntariness, including lack of knowledge about financial matters, amount of coercion, and the presence (or absence) of independent counsel. Unconscionable: Uneven divisions usually pass judicial muster. To overturn a premarital agreement, the challenging party must show that the agreement was so one-sided that it shocks the consciousness. Additionally, the agreement must have been unconscionable when it was made, because a subsequent increase in value does not invalidate a reasonably fair agreement. The challenging party has the burden of proof to establish invalidity by a preponderance of the evidence (more likely than not). An equitable premarital agreement gets your marriage off to a better start. For a free consultation with an experienced family law attorney in Port St. Lucie, contact Eighmie Law Firm, P.A. Convenient payment plans are available.